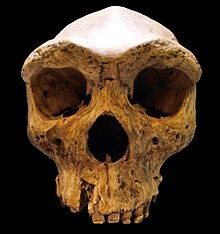 Homo rhodesiensis "Broken Hill Cranium": dated to either 130,000 years ago (using amino acid racemization determination) or 600,000 to 800,000 years ago (within the same time as Homo erectus), depending on which dating method is used. A number of varieties of Homo are grouped into the broad category of archaic humans in the period contemporary to and predating the emergence of the earliest anatomically modern humans (Homo sapiens) over 315 ka. The term typically includes Homo neanderthalensis (430+–25 ka), Denisovans, Homo rhodesiensis (300–125 ka), Homo heidelbergensis (600–200 ka), and Homo antecessor. There is no universal consensus on this terminology, and varieties of "archaic humans" are included under the binomial name of either Homo sapiens or Homo erectus by some authors. Archaic humans had a brain size averaging 1,200 to 1,400 cubic centimeters, which overlaps with the range of modern humans. Archaics are distinguished from anatomically modern humans by having a thick skull, prominent supraorbital ridges (brow ridges) and the lack of a prominent chin. Anatomically modern humans appear from over 160,000 years ago in Ethiopia and after 70,000 years ago (see Toba catastrophe theory), gradually supplanting the "archaic" human varieties. Non-modern varieties of Homo are certain to have survived until after 30,000 years ago, and perhaps until as recently as 12,000 years ago. Which of these, if any, are included under the term "archaic human" is a matter of definition and varies among authors. Nonetheless, according to recent genetic studies, modern humans may have bred with "at least two groups" of ancient humans: Neanderthals and Denisovans. Other studies have cast doubt on admixture being the source of the shared genetic markers between archaic and modern humans, pointing to an ancestral origin of the traits which originated 500,000–800,000 years ago. Another group may also have been extant as recently as 11,500 years ago, the Red Deer Cave people of China. Chris Stringer of the Natural History Museum in London has suggested that these people could be a result of mating between Denisovans and modern humans. Other scientists remain skeptical, suggesting that the unique features are within the variations expected for modern human populations. The category archaic human lacks a single, agreed upon definition. According to one definition, Homo sapiens is a single species comprising several subspecies that include the archaics and modern humans. Under this definition, modern humans are referred to as Homo sapiens sapiens and archaics are also designated with the prefix "Homo sapiens". For example, the Neanderthals are Homo sapiens neanderthalensis, and Homo heidelbergensis is Homo sapiens heidelbergensis. Other taxonomists prefer not to consider archaics and modern humans as a single species but as several different species. In this case the standard taxonomy is used, i.e. Homo rhodesiensis, or Homo neanderthalensis. The evolutionary dividing lines that separate modern humans from archaic humans and archaic humans from Homo erectus are unclear. The earliest known fossils of anatomically modern humans such as the Omo remains from 195,000 years ago, Homo sapiens idaltu from 160,000 years ago, and Qafzeh remains from 90,000 years ago are recognizably modern humans. However, these early modern humans do possess a number of archaic traits, such as moderate, but not prominent, brow ridges. The emergence of archaic humans is sometimes used as an example of punctuated equilibrium. This occurs when a species undergoes significant biological evolution within a relatively short period. Subsequently, the species undergoes very little change for long periods until the next punctuation. The brain size of archaic humans expanded significantly from 900 cm3 (55 cu in) in erectus to 1,300 cm3 (79 cu in). Since the peak of human brain size during the archaics, it has begun to decline. Robin Dunbar has argued that archaic humans were the first to use language. Based on his analysis of the relationship between brain size and hominin group size, he concluded that because archaic humans had large brains, they must have lived in groups of over 120 individuals. Dunbar argues that it was not possible for hominins to live in such large groups without using language, otherwise there could be no group cohesion and the group would disintegrate. By comparison, chimpanzees live in smaller groups of up to 50 individuals. ^ Hublin, J. J. (2009). "The origin of Neandertals". Proceedings of the National Academy of Sciences. 106 (38): 16022–7. Bibcode:2009PNAS..10616022H. doi:10.1073/pnas.0904119106. JSTOR 40485013. PMC 2752594. PMID 19805257. ^ a b c Dawkins (2005). "Archaic homo sapiens". The Ancestor's Tale. Boston: Mariner. ISBN 978-0-618-61916-0. ^ Barker, Graeme (1 January 1999). Companion Encyclopedia of Archaeology. Routledge. ISBN 9780415213295 – via Google Books. ^ Telegraph Reporters (14 August 2012). "Neanderthals did not interbreed with humans, scientists find". Telegraph.co.uk. ^ Association, Press (4 February 2013). "Neanderthals 'unlikely to have interbred with human ancestors'". The Guardian – via The Guardian. ^ Lowery, Robert K.; Uribe, Gabriel; Jimenez, Eric B.; Weiss, Mark A.; Herrera, Kristian J.; Regueiro, Maria; Herrera, Rene J. (2013). "Neanderthal and Denisova genetic affinities with contemporary humans: Introgression versus common ancestral polymorphisms". Gene. 530 (1): 83–94. doi:10.1016/j.gene.2013.06.005. PMID 23872234. ^ Amos, Jonathan (March 14, 2012). "Human fossils hint at new species". BBC. Retrieved March 14, 2012. ^ James Owen (2012-03-14). "Cave Fossil Find: New Human Species or "Nothing Extraordinary"?". National Geographic News. ^ Huyssteen, Van; Huyssteen, Wentzel Van (12 April 2006). Alone in the World?. Wm. B. Eerdmans Publishing. ISBN 9780802832467 – via Google Books. ^ Zyga, Lisa (15 March 2010). "Cro Magnon skull shows that our brains have shrunk". phys.org. Retrieved 14 June 2017. ^ Dunbar (1993). Grooming, Gossip, and the Evolution of Language. Harvard University Press. ISBN 978-0-674-36336-6.